Weaning is a crucial moment occurring during the first months of a foals life. 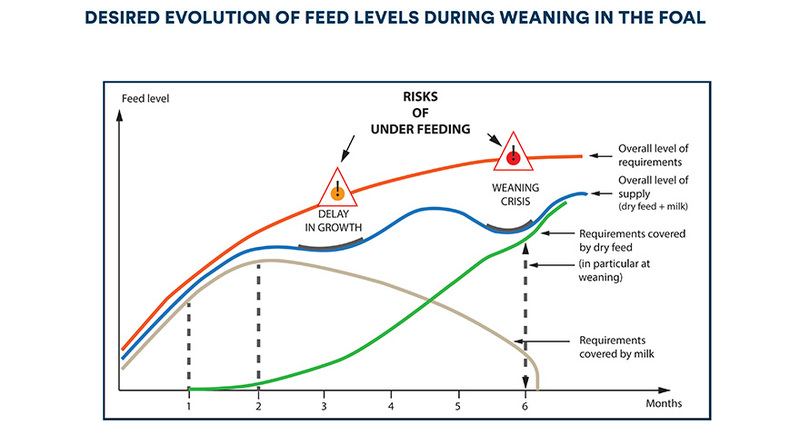 A badly prepared weaning can lead to a “growth crisis ” that can have long term repercussions if not followed by “compensatory growth” during the following months. The exact date of weaning depends on each foals’ capabilities and progression during his first months of life. In the main it takes place between 5 and 7 months of age. However, the age of the foal is not the only criteria to be taken into consideration. For example, the foals’ weight and the amount of feed being consumed daily are objective indicators to better evaluate the true aptitude of a foal for being deprived of maternal milk. Thus it is considered that a thoroughbred foal can be weaned at a minimum weight of 225 kg and if eating at least 2 – 2.5 kg of a transitional weaning feed. II. How to go about it? The separation of a broodmare from her offspring is likely to cause different stresses that can all affect the foals’ growth. It is therefore important that the foal is properly prepared for this determining event in the next months of his life. Separation between the mare and foal leads to a psychological stress which will be more or less intense depending on the weaning method. Amongst the known methods, the best is that which suits your set up and which will limit stress and injury to both the foal and mare. Pasture weaning or Interval weaning: Within a herd, minimal psychological stress following the sudden separation between broodmare and foal can be achieved if not all the mares are withdrawn at the same time. On studs using this method, one or two dams of the oldest foals are removed and taken far from the group whilst their foals are at a distance. Other broodmares are then taken out at regular intervals (ex. one a week) or when their foals have attained the desired age. Weaning is immediate, but the foals do not lose all their bearings. Indeed, even if their dam is no longer present, the foals remain within their herd which is not completely de-structured in one blow. In this way, in most cases, stress at weaning is limited. Despite this, it is important to watch the foals during the moments following the withdrawal of their dams. This method takes longer, however it is gentler and each foal can be weaned when he has reached the desired age and weight. When pasture weaning is impossible (for example there is only one foal to be weaned), then we can resort to other methods such as abrupt or gradual weaning. Abrupt weaning: As its’ name indicates, the mare is withdrawn abruptly. It is possible to substitute the mother by another animal (donkey, pony, gelding, etc.). This is an interesting solution, even if all excessive attachment phenomena which could lead to a new stressful separation situation must be avoided. Thus it is preferable to leave the foal alone for 24h after withdrawing the mare before introducing any companion. When abrupt weaning is practised on a stud where a number of foals are weaned at the same time, they are often placed in loose boxes in pairs. However, studies have shown statistically higher levels of cortisol (stress hormone) in foals weaned in this way than observed in foals weaned by being placed alone in a loose box. It is possible that this difference is related to lack of space and the dominance of one foal over the other. The dominant foal may show his stress by aggressive behaviour towards his stable companion who is unable to flee in the confined environment. A study led in 1990 at Rutgers University in New Jersey showed that even if foals weaned in pairs were calmer (less agitation and neighing), they were more immunodeficient as more stressed, and therefore more susceptible to illness than foals weaned alone. Consequently, if a number of foals are being weaned at the same time, the best solution is place them singly, but in adjacent loose boxes, making sure they can see each other (stable separations with openings). Gradual weaning: The foal is progressively separated from his dam. When a single foal is being weaned, the easiest and safest way is to place the mare and her foal in a large loose box divided into two by a separation that allows the foal to touch his dam but not to suckle. The mare can be progressively distanced whilst staying on the same yard. This method takes on average 7 to 10 days and is generally accepted by both parties who gradually lose interest in each other. When a number of foals are being weaned simultaneously, a collective and gradual weaning outside (adjacent field weaning) is possible. The foals are placed together in a small paddock which offers enough space to avoid conflicts. These enclosures are placed adjacent to those of the mares and separated by a fence which does not allow the foals to suckle, although they can see and even touch. As for the mares, they remain in a large paddock that can be increased in size after a few days in order to allow them to progressively move away from the foals paddock, weaning themselves from their foals. Generally, weaning takes a week and doesn’t cause a lot of stress or injury. Whatever method is chosen, it is important to manipulate the foal before weaning, accustom him to wearing a head-collar and to being led in-hand. This really facilitates the handling that is required at weaning, if, in addition to the weaning related stress, the latter has never been handled this can prove to be dangerous for both breeder and foal. It should be noted that the earlier this handling takes place (in the days following birth) the easier it is to carry out. In effect it is at this moment that the foal has the least strength and the least risk of injury. From a dietary point of view, weaning corresponds to the stopping of maternal milk and the passage to solid vegetable feedstuffs. Badly prepared, this transition can provoke digestive problems (perturbations of the gut flora with diarrhoea, etc.) which can disturb the correct growth and development of the foal. Consequently, introducing a transitional concentrate feed containing dairy products associated with raw ingredients of vegetable origin, allows the foals’ organism to progressively become accustomed to this change of diet. The feed “FOAL” is particularly suited to this job. It contains skimmed milk powder which notably stands out against whey by its’ high level of milk proteins (about three times higher). Like this, associated with non GM (guaranteed to 99.1%) soya vegetable proteins and sources of fats and oils rich in omega 3s (extruded linseed), it allows to prepare for and gives security to weaning, limiting any growth crisis if correctly fed. FOAL can be introduced a few weeks after birth. The daily feeding of a handful of FOAL from 15 days old in a creep feeder (or a foal park) allows the foal to progressively become accustomed to a solid diet. Well before weaning, this method also anticipates for the drop in maternal milk production that occurs at 3 months thus avoiding the delay in growth with which this can be associated. Finally, towards 5 to 6 months of age, complete weaning from maternal milk can take place when the foal is capable of eating sufficient “FOAL” (2 – 2.5 kg per day) and forage (hay, grass). Once weaned, it is recommended to continue feeding “FOAL” for at least two months before changing to a 100% vegetable based feed such as YEARLING. Lastly, FOAL contains bacterial assimilation factors obtained from the lactic fermentation of germinated barley. Given at an effective dosage, these prebiotics help the young flora to establish and contribute to optimal digestion of fibre rich raw ingredients of vegetable origin (concentrates and forage). If the feed being employed is lacking prebiotics or probiotics it is advisable to use REVERDY FLORA. Distribute for a minimum of a week before weaning and during the two weeks following, this feed supplement provides high doses of probiotics (live yeasts) and prebiotics (lactic ferments from germinated barley and fermented organic bread), which contribute to limiting digestive perturbations. Weaning is the major event during the first months of the foals’ life. If it is badly prepared, it can lead to delays in growth and development which can compromise the future athletic career of the foal. A bad weaning is even more serious if the young horse is brought into work early and in an intensive fashion. Furthermore, Wolter (1999), stated that, early, and above all badly prepared weaning can in the long term lead to much more insidious problems, notably in future broodmares who ultimately revealed being less fertile, and producing weaker, slower growing foals whose skeletons were less resistant. It is therefore important that weaning takes places in the best possible conditions. To do this, a number of methods exist although each of them has their advantages and disadvantages. Whatever the methods, the early handling of foals beginning in the first weeks of life, and the feeding of a quality concentrate feed enables the foal to be the best prepared for separation from his dam. Wolter R., Alimentation du cheval, Editions France Agricole, 2è édition, 1999.